You probably wouldn’t normally consider soup a “sheetpan dinner,” but this recipe certainly falls into that category. Roasting vegetables - of any kind, really - deepens their flavors and brings out the natural sugars, thus doing all the seasoning work for you. 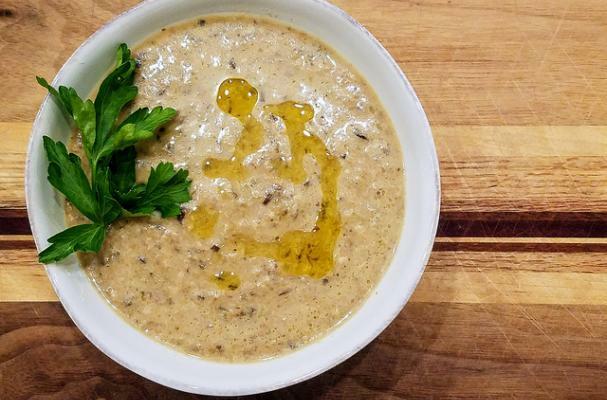 What I love about this mushroom soup recipe is it’s super duper easy, it’s filled with healthy goodness (‘shrooms are loaded in antioxidants and other good-for-you vitamins and minerals), and clean-up is a cinch. You can easily make it on a weeknight without breaking a sweat. Serve it with a green salad or ooey gooey grilled cheese sandwiches. It’s the perfect comforting dinner on a cold and rainy night! Mushroom trivia: Did you know that mushrooms get healthier once they're cooked? Their cell walls are indigestible otherwise, so heat is needed to break them down. Plus, they taste so much better when roasted! This recipe is also gluten free and vegan (if you use vegetable stock)! Line a sheet pan with foil (for easy cleanup!). Place mushrooms and onions on the pan and drizzle with olive oil. Season with salt, pepper, and dried thyme, then give it all a good toss to distribute the oil. Place in the oven and roast for about 35-40 minutes. 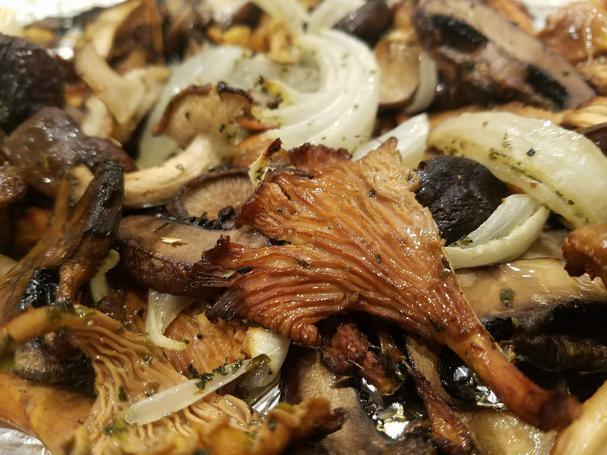 Transfer the mushrooms and onions to a medium-size pot (pour any juices from the sheet pan into the pot - there’s a ton of flavor there! ), add the stock and sherry, and bring to a boil. Let boil for about 1 minute or until the alcohol of the sherry has cooked off (do a taste test to make sure). Adjust salt and pepper seasoning if necessary. Remove from the heat, add the cream. Using an immersion stick blender, blend to your desired consistency (I like mine a bit chunky). For a creamy version, transfer in batches to a blender and process until smooth (place a towel over the lid to prevent hot liquid from emerging and burning yourself). Ladle into bowls and drizzle with truffle oil. Serve immediately.